The Sable high-speed handpieces are available in two styles, the Access™ S4500KL mini head and the RotaMax™ S6500KL torque head. These fiber optic highspeed handpieces are designed to provide maximum air driven power with smaller head sizes for optimal comfort and visibility. Sable handpieces have a durable titanium finish and ceramic bearings that deliver vibration-free performance while running longer at a lower decibel level. The handpieces have a 25,000 LUX fiber-optic illumination, a triple water spray system and a push button chuck mechanism. Sable handpieces are KaVo-compatible and work with the existing power optic system via the MULTIflex-style coupler. Sable Access and RotaMax highspeed handpieces are backed by a one-year warranty. Thirteen consultants evaluated these handpieces with a six-hole, 360° KaVo Multiflex LUX type coupler in 712 uses. 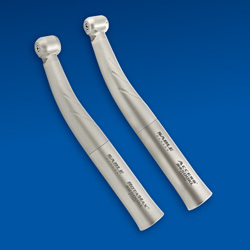 These highspeed handpieces received a 91% clinical rating. Sable Access™ S4500KL and RotaMax™ S6500KL high-speed handpieces were used by consultants for a variety of clinical procedures. Thirty-one percent of consultants rated Sable Access and RotaMax better than other highspeed handpieces they had used and 54% rated them to be equivalent. Fifty-four percent would switch to Sable Access and RotaMax and 77% would recommend them. The handpieces fit securely onto KaVo-style couplers for quick-connect convenience. The Sable Access™ S4500KL and RotaMax™ S6500KL finish, light weight and balance were all highly rated. The mini-head is 1.5mm shorter than the full-size head, and both provide adequate torque for the majority of dental procedures. Light and water output were rated very good o excellent. 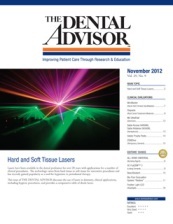 Watch for long-term performance results of Sable Access™ S4500KL and RotaMax™ S6500KL in an upcoming issue of THE DENTAL ADVISOR.